During the month of June, The Innovation Academy for Women of the Americas, “The Academy,” will be hosted on UNM’s main campus. Designed to facilitate more women in the STEM+Architecture fields to pursue graduate study, the program is unique as it unites women across the Americas with a special focus on promoting the advancement of indigenous women in these disciplines. It further emphasizes the important role of indigenous communities in the advancement of science and technology in the history of the Americas. 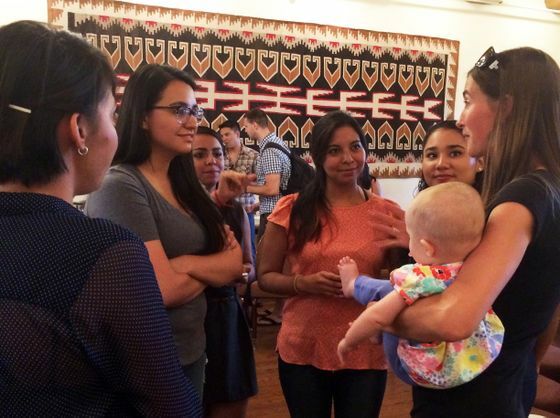 The Academy provides unique international engagement experiences for UNM participants who are interfacing with sixteen women from Mexico in the STEM+Architecture disciplines. There are many opportunities to engage with the program. Read more about it by visiting the UNM Newsroom story or visit the initiative’s Facebook page. The next public event will be a presentation on the History of Science and Technology from a Native American Perspective on Thursday, June 16 at 5:30 p.m. in the Willard Room in Zimmerman Library. The keynote speaker will be Dr. Gregory Cajete from the UNM Native American Studies department. For more information contact: Danielle Gilliam, administrative officer, UNM Global Education Office at dgilliam@unm.edu. The Academy hosted an open dialogue on “Motherhood & Career” on June 14. Several professionals from the STEM+Architecture fields arrived, some with their children, to discuss the importance of balancing career and family. Professor Jessica Rowland, UNM Sustainability Studies, holds her newborn, Madeleine, while discussing her personal story with Ana Laura Gonzalez Perez, Lizeth Cueto, Jacqueline Cabrera Fosado, Emilia Gonzalez Avila, and Laura Melissa Sanchez Salas.